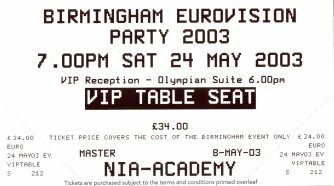 I had a opportunity to go to the first Birmingham Eurovision Party 2003 on Saturday 24 May 2003. Tickets cost £34 for the VIP ticket and £17 for the ordinary ticket. VIP tickets had the following benefits over the ordinary tickets. A Buzz Fizz or non alcoholic drink (orange juice) at reception. 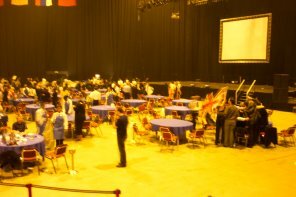 Table seating on the Arena floor. 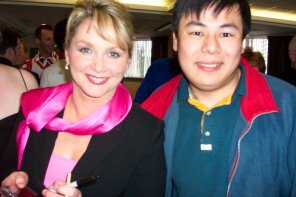 I got a chance to meet both Gina G and Cheryl Baker and got both their photos and autographs. 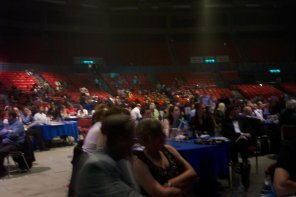 Around 6:45pm, we all headed towards our table on the Arena Floor. There were tables everywhere. Now we are feeling very important. 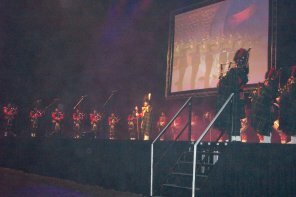 Just after 7.10pm, the night started by showing the original 1998 Eurovision clip then a marching band came on stage. May be the original ones from 1998? 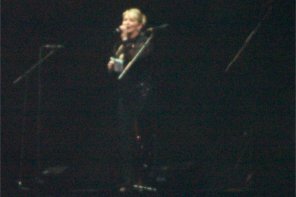 Cheryl Baker, the host of the evening came on stage to welcome everyone to the arena. Terry Wogan left a special message for the people who are at the party. 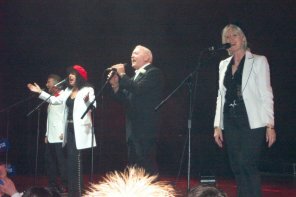 Soon after, previous Eurovision Winner, Brotherhood of Man came on stage to sing some of their songs. When they came on stage, a lot of people suddenly got off their seats and headed to the front of the arena next of the stage. 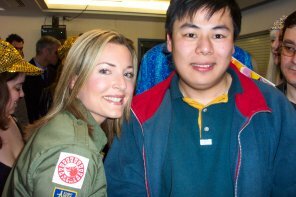 There were no attempt by any of the security staff to stop people doing that. It is a party. So people were dancing, taking photos and basically enjoying themselves. 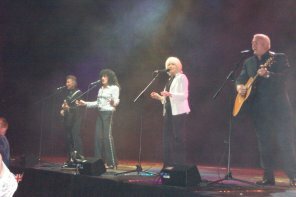 About 7:40pm, Gina G came on stage to do a few numbers. Same thing happened, everyone got up. Not to mention her dress! Also Gina went into the crowd and still singing! 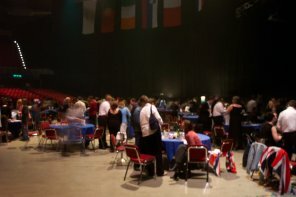 About 8pm, the Eurovision Song Contest 2003 started and we all got back to our seats and watched the contest on huge screens. I had a loudspeaker next to me, and the volume was loud. Some of the key points before the contest. 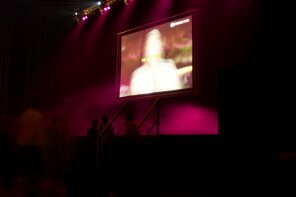 Cheers when Terry Wogan mentions Parties across the country including National Indoor Arena, Birmingham. Everyone was going crazy when the UK came on. Some even got up and dance at the front of the arena. 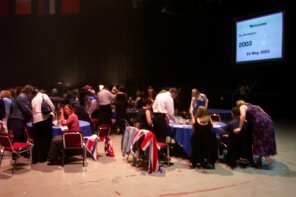 Everyone had a chance to vote for their favourite in the arena. Well I televoted as well as voted in the arena. Results below. 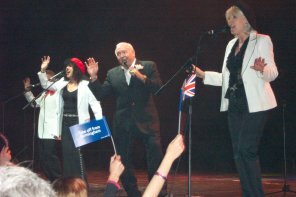 Prizes were given away to the best fancy dressed group, a draw from all the votes to win tickets to Westlife. After the contest has ended, the arena winners were announced. In last place with no votes at all, France. 3rd Place was Sweden with 9% of the votes. 2nd Place was the United Kingdom with 10% of the votes and the arena winner was Germany with 20% of the votes. It was a fantastic night and left around 11:30pm. 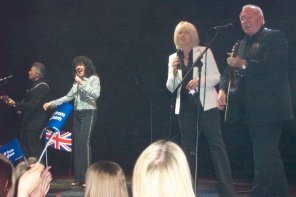 They may be a Eurovision Party 2004. May go to Turkey instead!